Assuming a fall from a survivable height, will a cat always land on its feet? Has this been studied? Is there real data to back it up? The cat is healthy and more than ~seven-weeks old. 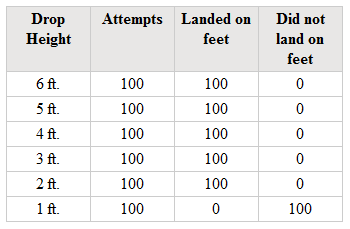 If dropped from a height of more than ~1.5 feet and less than ~700 feet. The vertical velocity of the cat is less than ~60 mph (terminal velocity for cats). A cat dropped upside-down turns over very rapidly - in fact, it will do so within its own standing height. “How does a cat fall on its feet?”, The New Scientist, vol. 7, no. 189, pp. 1647-9. Étienne-Jules Marey experimented on cats by shooting them (Video). With his chronophotographic gun. where m is the mass of the cat, a is the acceleration of the cat, and -mg is the force of gravity (assuming up is positive), where g is a constant (g = 979 cm/sec2 at a latitude like San Diego when you add centripetal acceleration to the standard value given for g, which is 980.7 cm/sec2 ). See: Differential Equations and Integration for all the fun math. The maximum height and velocity are related. Once weightless the cat has no "down" and might not maintain proper orientation. Disorientation of animals in microgravity. What appears to happen is that in falls from above 7 stories, cats have time to reach terminal velocity, the speed at which their drag due to wind resistance equals their weight due to gravity and they stop accelerating. At this speed, the cat relaxes its limbs and is better able to survive the impact (at a slight cost – they get less broken limbs, but more chest injuries). Does a Cat Always Land on Its Feet ? Fiorella Gambale, Ph.D. NOTE: A cat with a piece of buttered toast attached to its back, butter side up, will not land on its feet. In fact the forces create by this configuration will cause the cat to hover. Related cat physics: Cat Swinging. Principles & Mechanics. Not the answer you're looking for? Browse other questions tagged biology physics zoology . Is it dangerous to throw a coin off a building?